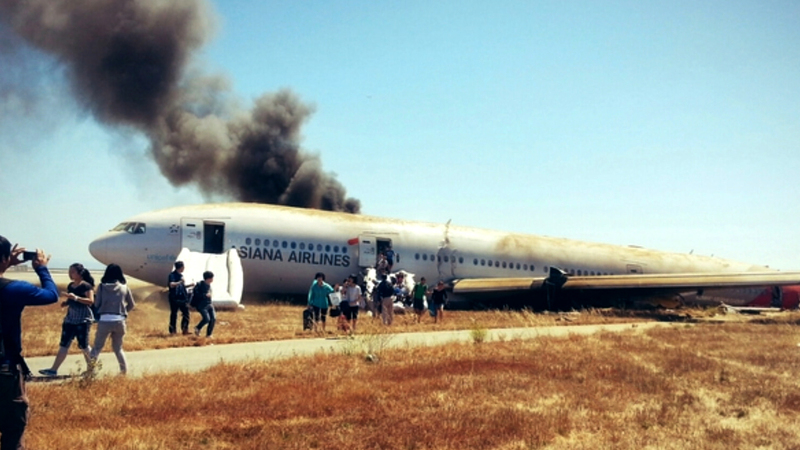 SAN FRANCISCO The pilot at the controls of an Asiana plane that crashed was getting on-the-job training, the carrier's CEO revealed Monday. Yoon Young-Doo told reporters Lee Gang-guk "was undergoing an OJT (on-the-job training) flight in order to gain experience in order to fly a new type of airplane. For this OJT flight, an experienced pilot with more than 10,000 hours of flight experience, was onboard as an instructing pilot, and took all responsibility regarding flight." Yoon denied that the airline is placing more weight on Lee's inexperience as it investigates, saying, "We're currently awaiting results from America's NTSB (National Transportation Safety Board)." "OJT flights are a widely accepted training practice in the international aviation industry," Yoon continued. " ... The speculation (that Lee's inexperience was a factor) is something that cannot be permitted and is different from fact." Aviation and airline officials said Sunday that Lee was guiding a Boeing 777 into the San Francisco airport for the first time, and tried but failed to abort the landing after coming in too slowly to set down safely. It remained unclear whether the pilot's inexperience with the aircraft and airport played a role in Saturday's crash. Officials were investigating whether the airport or plane's equipment could have also malfunctioned. South Korea's government announced Monday that officials will inspect engines and landing equipment on all Boeing 777 planes owned by Asiana and Korean Air, the national carrier. Also Sunday, San Mateo County Coroner Robert Foucrault said he was investigating whether one of the two teenage passengers killed Saturday actually survived the crash but was run over by a rescue vehicle rushing to aid victims fleeing the burning aircraft. Remarkably, 305 of 307 passengers survived the crash and more than a third didn't even require hospitalization. Only a small number were critically injured. Deborah Hersman, head of the NTSB, said the slow speed of Flight 214 in the final approach triggered a warning that the jetliner could stall, and an effort was made to abort the landing but the plane crashed barely a second later. At a news conference, Hersman disclosed the aircraft was traveling at speeds well below the target landing speed of 137 knots per hour, or 157 mph. "We're not talking about a few knots," she said. Hersman described the frantic final seconds of the flight as the pilots struggled to avoid crashing. Pilots normally try to land at the target speed, in this case 137 knots, plus an additional five more knots, said Bob Coffman, an American Airlines captain who has flown 777s. He said the briefing raises an important question: "Why was the plane going so slow?" The plane's Pratt & Whitney engines were on idle and the pilots were flying under visual flight rules, Hersman said. Under visual flight procedures in the Boeing 777, a wide-body jet, the autopilot would typically have been turned off while the automatic throttle, which regulates speed, would been on until the plane had descended to 500 feet in altitude, Coffman said. At that point, pilots would normally check their airspeed before switching off the auto throttle to continue a "hand fly" approach, he said. There was no indication in the discussions between the pilots and the air traffic controllers that there were problems with the aircraft. The airline said Monday in Seoul that the pilot at the controls had little experience flying that type of plane and was landing one for the first time at that airport. Asiana spokeswoman Lee Hyomin said Lee Gang-guk, who was at the controls, had nearly 10,000 hours flying other planes but only 43 in the 777, a plane she said he still was getting used to flying. Another pilot on the flight, Lee Jeong-min, had about 12,390 hours of flying experience, including 3,220 hours on the 777, according to the Ministry of Land, Infrastructure and Transport in South Korea. Lee was the deputy pilot, tasked with helping Lee Gang-guk get accustomed to the 777, according to Asiana Airlines. Among the questions investigators are trying to answer was what, if any, role the deactivation of a ground-based landing guidance system due to airport construction played in the crash. Such systems help pilots land, especially at airports like San Francisco where fog can make landing challenging. The conditions Saturday were nearly perfect, with sunny skies and light winds. The flight originated in Shanghai, China, stopped over in Seoul, South Korea, before making the nearly 11-hour trip to San Francisco. The South Korea-based airline said four South Korean pilots were on board, three of whom were described as "skilled." Among the travelers were citizens of China, South Korean, the United States, Canada, India, Japan, Vietnam and France. There were at least 70 Chinese students and teachers heading to summer camps, according to Chinese authorities. Passenger Benjamin Levy, of San Francisco,told CBS San Francisco station KPIX-TV he knew something was wrong as he looked out the window while the plane descended over the bay toward the edge of the runway. "It was shocking, we were so low and it wasn't even the runway yet," he said. Levy said he then felt the pilot go "full throttle and put the engine in full speed. That to me said we're too low." He said he saw "walls of water" because of how low the plane was over the bay, then the aircraft hit the edge of the runway, bounced back up in the air and then slid to a stop. "It hit really hard, then started going up again ... I wasn't quite sure where we were," he said. He said he heard screaming when the plane crashed down, "but then people realized they're alive, snapped out of it and started moving." Levy says he helped to open the closest emergency door to him despite pain in his torso -- he thought he had broken some ribs but later found out they were only bruised -- and helped other passengers get out. Fei Xiong, a Chinese passenger , was traveling to California so she could take her 8-year-old son to Disneyland. The pair was sitting in the back half of the plane. Xiong said her son sensed something was wrong. When the plane hit the ground, oxygen masks dropped down, said Xu Da, a product manager at an Internet company in Hangzhou, China, who was sitting with his wife and teenage son near the back of the plane. When he stood up, he said he could see sparking -- perhaps from exposed electrical wires. He turned and could see the tail where the galley was torn away, leaving a gaping hole through which they could see the runway. Once on the tarmac, they watched the plane catch fire, and firefighters hose it down. "I just feel lucky," said Xu, whose family suffered some cuts and have neck and back pain. In the chaotic moments after the landing, when baggage was tumbling from the overhead bins onto passengers and people all around her were screaming, Wen Zhang grabbed her 4-year-old son, who hit the seat in front of him and broke his leg. Spotting a hole at the back of the jumbo jet where the bathroom had been, she carried her boy to safety. "I had no time to be scared," she said. Authorities immediately closed the airport and rescuers rushed to the scene. A United Airlines pilot radioed the control tower, saying: "We see people ... that need immediate attention. They are alive and walking around." "Think you said people are just walking outside the airplane right now?" the controller replied. "Yes," answered the pilot of United Flight 885. "Some people, it looks like, are struggling." At the crash scene, police officers handed knives up to crew members inside the burning wreckage so they could cut away passengers' seat belts. Passengers jumped down emergency slides, escaping from billowing smoke that rose high above the bay. Some passengers who escaped doused themselves with water from the bay, presumably to cool burns, authorities said. By the time the flames were out, much of the top of the fuselage had burned away. The tail section was gone, with pieces of it scattered across the beginning of the runway. Foucrault, the coroner, said senior San Francisco Fire Department officials notified him and his staff at the crash site on Saturday that one of the 16-year-olds who was killed may have been struck on the runaway. Foucrault said an autopsy he expects to be completed by Monday will involve determining whether the girl's death was caused by injuries suffered in the crash or "a secondary incident." He said he did not get a close enough look at the victims on Saturday to know whether they had external injuries. Foucrault said one of the bodies was found on the tarmac near where the plane's tail broke off when it slammed into the runway. The other was found on the left side of the plane about 30 feet away from where the jetliner came to rest after it skidded down the runway.